Listening to the story from Christine Blasey Ford, one has to wonder, why nothing was said for years, and why now? We know details of her, she is a liberal professor, in a very liberal college, she and the rest of the left are determined to do anything they can within their power to stop the Kavanaugh vote from going forward. But we have to ask the most important question, why now? Christine Blasey Ford, a professor at Palo Alto University in California, told The Washington Post that she had feared Kavanaugh “might inadvertently kill” her as he held her down and groped her while they were both high school students around 1982. Christine Blasey Ford alleges another teenager watched as a drunken Kavanaugh attempted to remove her clothing at a gathering outside Washington in suburban Maryland. She tried to scream, but Kavanaugh covered her mouth to silence her, she told the Post. She said she escaped after Kavanaugh’s friend entered the room and jumped on top of both of them. Kavanaugh, 53, has denied any wrongdoing. Christine Blasey Ford had been requesting anonymity, but she decided to identify herself in the Post article published early Sunday afternoon. As a rule, I am totally in favor of protecting a victim, but 35 years later, drunk at a party, and this is what you recall? The problem you also have is this is exactly what he doesn’t recall, so we go by the merit of the case and the situation surrounding this. 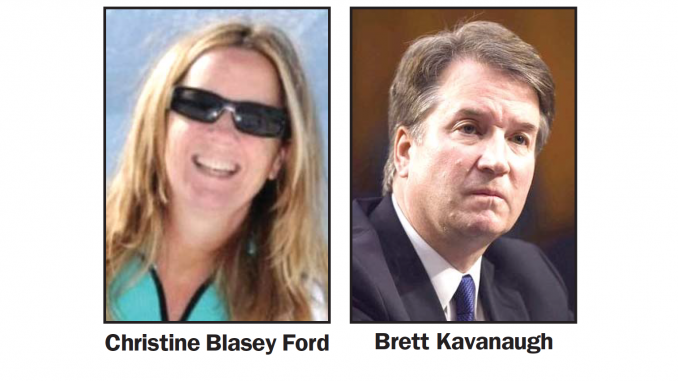 We have the left, which has shown in colleges, that they are willing to go to any extreme to stop this nomination and oppose anything Trump or the GOP wants to do, you have professor Christine Blasey Ford that is very much part of this system, who as if by magic now has a recollection of the event, says while drunk she thinks this was him, he was laying on top of her, but the other witness and Kavanaugh says this never happened, sorry don’t buy it. Several other Democratic lawmakers, including Sen. Mazie Hirono (D-Hawaii) and Senate Minority Leader Chuck Schumer (D-N.Y.), on Sunday echoed Feinstein’s call for a delayed vote on Kavanaugh. Grassley “must postpone the vote until, at a very minimum, these serious and credible allegations are thoroughly investigated,” Schumer said in a statement. The White House reiterated its support for Kavanaugh, a federal appellate court judge, in the wake of the latest development. “We are standing with Judge Kavanaugh’s denial,” White House principal deputy press secretary Raj Shah said in a statement to Fox News on Sunday. It is time to cut this charade, not surprisingly the anti-Trump Flake is also joining this, but he like the other idiots are on their way out, could care less what he wants, push the vote forward, time to call the bluff and put Kavanaugh on the high bench. PreviousAre You Kidding Me? The Left Claiming They Have Religious Superiority.